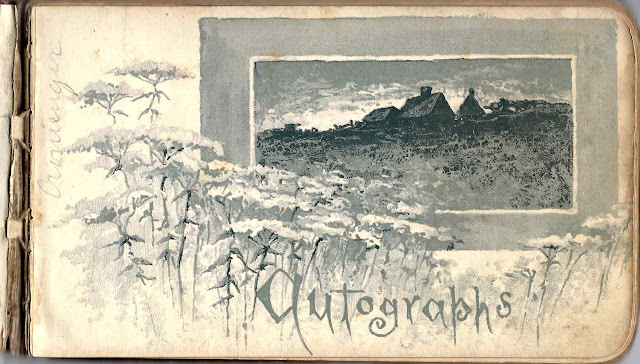 1880s autograph album of Vinnie Blanche Shaffer of Tedrow, Ohio. An earlier post featured the 1880s autograph album of Vinnie's future husband, Benjamin Franklin Gasche of Pettisville, Ohio, who then went by the name of Frank B. Gasche. 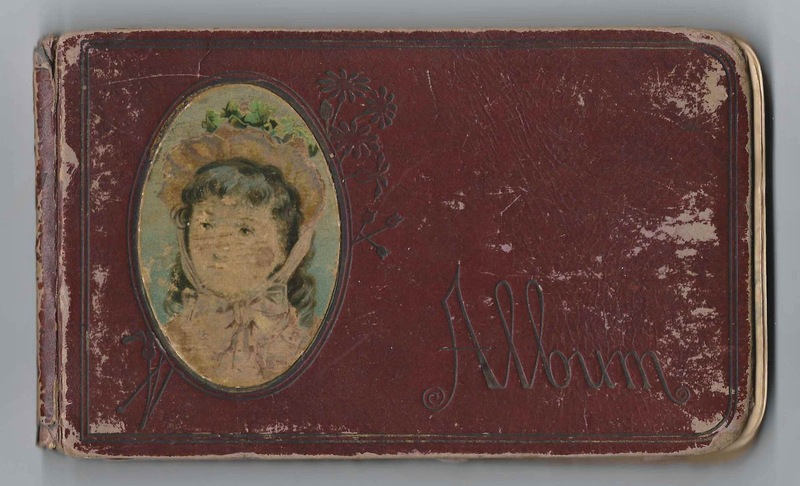 Vinnie's album is approximately 7" x 4-1/4" and contains the sentiments of over 70 of her relatives, friends and schoolmates. Many pages feature Victorian scraps. An alphabetical list of the signers appears at the end of this post. Vinnie penned the first page in the album on 3 February 1884. Vinnie Blanche Shaffer was born 13 November 1872 at Tedrow, Ohio, the daughter of John J. and Fidelia Elenor (Boyers) Shaffer. Vinnie's father signed a page in her album and gave his address as Spring Hill, Ohio. 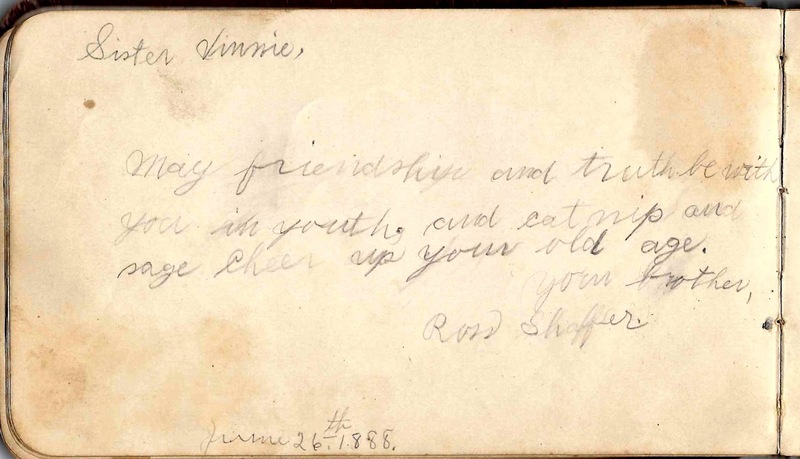 Vinnie's brother Ross Shaffer signed a page on 26 June 1888. Many of Vinnie's other relatives signed pages in her album, as indicated in the list below. Several ministers and teachers also signed pages. Vinnie married Benjamin Franklin Gasche on 22 December 1891. He was born 9 March 1868 at German, Ohio, the son of George and Catherine (Horneberger) Gasche. I assume he still went by the name of Frank in his adult life, but I'm not sure. 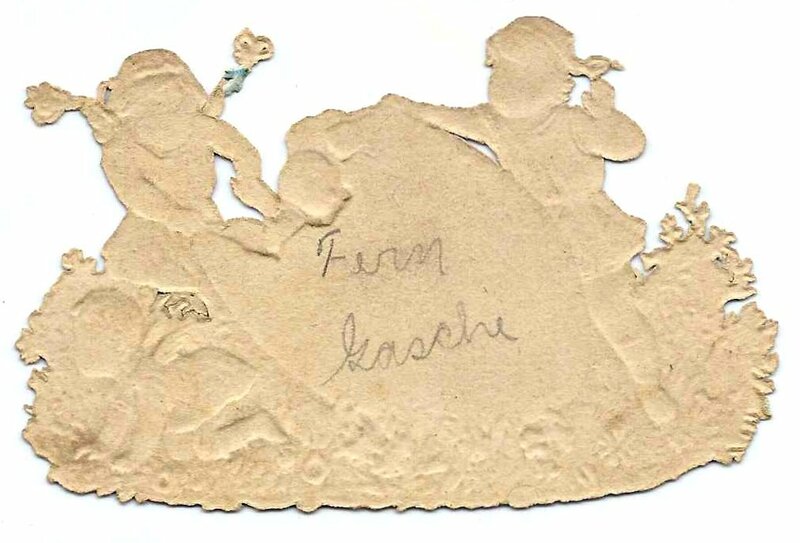 One of the several loose Victorian scraps in the album is signed on the reverse by Fern Gasche, a daughter born to Vinnie and Frank in 1894. Fern lived to nearly 100 years of age. Fern had an older sister Emma. L. A. S., signed on 10 February 1887 at Tedrow, Ohio. She or Vinnie wrote in pencil Lydia A. Schad. She was perhaps the Liddie Schad on 1880 Census of German, Ohio, that listed brother Samuel Schad, a signer farther along in the album. Aylett Ayers. On a page shared by others, with this message: "Give the old men a chance." A. C. Bartlett, Minister, signed at Defiance, Ohio, on "8/9-1884"
Aunt Jennie, signed on 25 January 1884. She was Hester Jane "Jennie" (Snyder) Boyers, first wife of William Levi Boyers, who signed the right facing page. He was the brother of Vinnie's mother Fidelia Eleanor (Boyers) Shaffer. 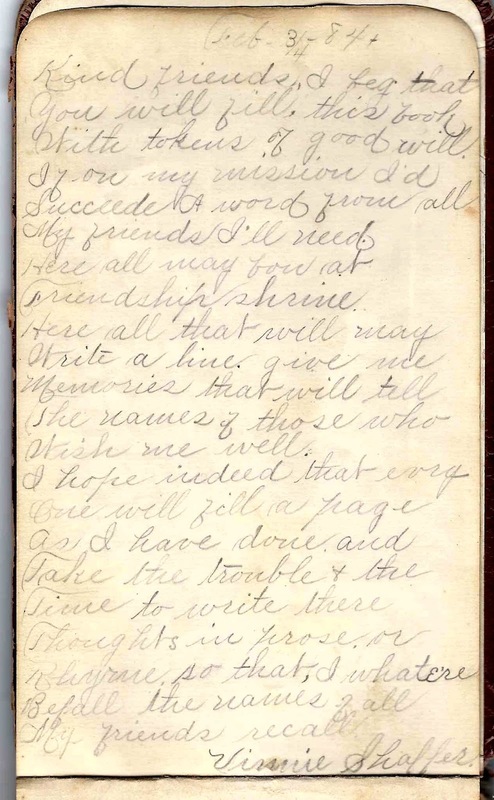 Uncle Levi, signed at Tedrow, Ohio, on 24 January 1884. Presumably William Levi Boyers, brother of Vinnie's mother Fidelia Eleanor (Boyers) Shaffer. 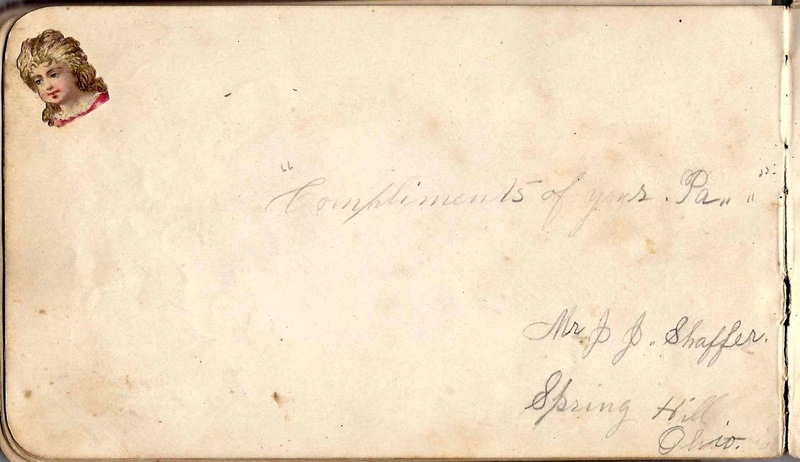 Levi's first wife Hester Jane "Jennie" (Snyder) Boyers signed the facing page to the left. Uncle Dealton, signed on 23 March 1884. Dealton Adelbert Boyers, who was a brother to Vinnie's mother Fidelia Eleanor Boyers. His wife was Laura Rebecca (Miley) Boyers, who signed the left facing page. Elizabeth Boyers, signed at Tedrow, Ohio, on 29 December 1884; Vinnie's aunt, married to Simeon J. Boyers, brother of Vinnie's mother Fidelia Eleanor (Boyers) Shaffer. S. J. Boyers, signed on 29 December 1884 at Tedrow, Ohio; Vinnie's uncle Simeon J. Boyers, whose wife Elizabeth signed the left facing page. Simeon was the older brother of Vinnie's mother Fidelia Eleanor (Boyers) Shaffer. Aunt Adda, signed on 1 June 1884, presumably Elma Adda Boyers, sister of Vinnie's mother Fidelia Eleanor (Boyers) Shaffer. Vinnie's cousin Estel Clark, signed at Delta, Ohio, in Fulton County. Ella Conaway, signed at Spring Hill, [no state given], on "1-2-84"
Mell Dickason, signed at Tedrow, Ohio, on "2-1-84"
Frank Dickason, signed at Tedrow, Ohio, on "1-6-84"
D. L. Fink. On a page shared by others, with this message: "Give the old men a chance." E. Garrett. On a page shared by others, with this message: "Give the old men a chance." Fern Gasche signed the back of a loose Victorian scrap found in the album. She was Vinnie's daughter with husband Benjamin Franklin Gasche. J. R. Kimerer of Shreve, Ohio, signed on "1-3-84"
Jerome Loveland; not positive of name. On a page shared by others, with this message: "Give the old men a chance." 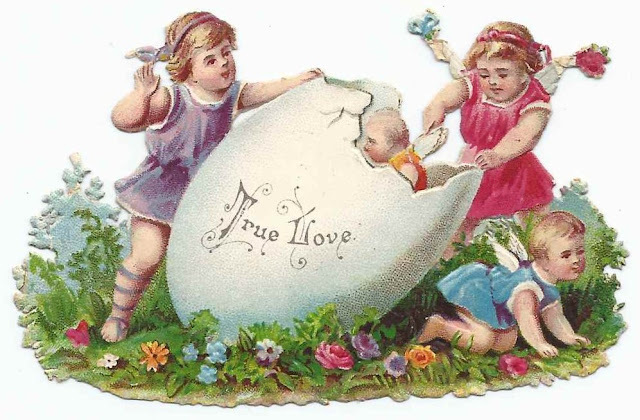 Aunt Sarah, signed on 8 November 1885. She was married to John Pocock, who signed the facing page. John Pocock, signed on 8 November 1885. He was Vinnie's uncle, married to Sarah, who signed the facing page. W. Proudfoot of Springhill, Ohio, signed on 29 October 1885. Samuel Schad, signed in ink on 31 March 1886 at Tedrow, Ohio. The date of 17 August 1887 is written in parentheses in pencil in lower left corner. Can you email me the price for this at Krismlong@yahoo.com please.